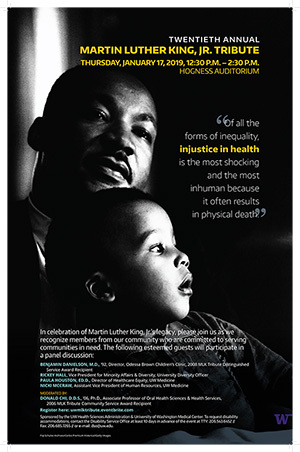 Join us for the 20th Anniversary celebration of the Martin Luther King, Jr. Tribute hosted by UW Health Sciences and UW Medical Center. We will celebrate the life and legacy of Dr. King and honor UW staff, faculty, and students for outstanding community service. There is a permanent plaque in the Health Sciences Lobby honoring all of the past and present Distinguished Service Award recipients. This is the 20th annual celebration. This year, we’ll have a special panel discussion about the role of health equity in serving the community. Reception with light hors d’oeuvres and beverages to follow in the Health Sciences Lobby.